Platelet Rich Plasma (PRP) a revolutionary and exciting new rejuvenating treatment. Microneedling encourages your skin to revitalize and renew itself naturally! One of the most promising treatments in the latest wave of facial rejuvenation procedures is platelet rich plasma (PRP) therapy. PRP is used to enhance facial volume, plump and fill in fine lines and wrinkles, and can be successfully utilized in the delicate areas around the eyes and mouth, where dermal fillers, lasers and neurotoxins may not be as effective. During a PRP skin treatment at Faces of South Tampa, a highly concentrated form of the client’s own blood is injected into the treatment area, stimulating the body’s stem cells to produce new collagen and blood vessels (responsible for delivering oxygen to bodily tissues and promoting cell turnover), thereby minimizing the appearance of any current signs of aging, and working to prevent the future formation of wrinkles and fine lines. Faces of South Tampa offers Microneedling for those clients who are not quite ready for laser skin resurfacing. Microneedling with the SkinPen™ by Bellus Medical is a new aesthetic treatment that encourages your skin to revitalize and renew itself naturally. The microneedling device slides along the skin, penetrating the upper layers of the skin to a depth of up to 2mm to create numerous tiny needle wounds. The procedure prompts the body to respond through the creation of new collagen and elastin fibers. In response to the stimulus, the skin plumps and thickens, reducing the appearance of scars, stretch marks and fine lines and wrinkles. Microneedling is a gentler anti-aging therapy than other forms of skin resurfacing, encouraging collagen production while at the same time helping to reduce the appearance of sun spots and other signs of aging. A long-lasting solution that works in conjunction with your body’s natural rejuvenation process, microneedling stimulates your skin’s ability to actually repair itself. 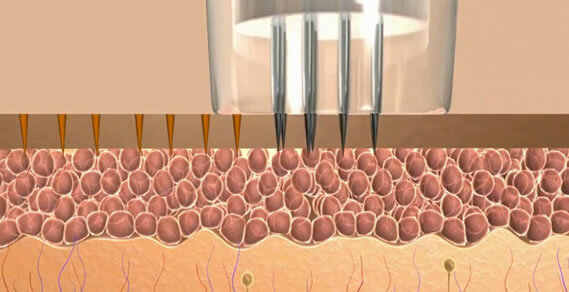 Microneedling produces microscopic channels in the dermis to help stimulate the body’s natural defenses and produce a thickening of the skin by up to 80 percent. 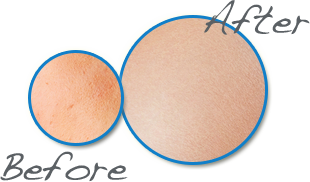 Scars, stretch marks and wrinkles can be visibly reduced with no injections, incisions or downtime required. Microneedling is a great solution for clients of Faces, who want to find a happy medium between mild chemical peels and more involved laser resurfacing. The use of the SkinPen (microneedling procedure) and the Platelet Rich Plasma may be used in conjunction instead of merely injecting the PRP into the client’s skin. The PRP is topically applied to the skin immediately following a microneedling procedure. The micro-channels created by microneedling provide direct pathways to the deeper layers of skin for optimal wound healing. Microneedling with PRP application is an ideal treatment for smoothing fine lines, wrinkles, and scars or even increasing plumpness and overall rejuvenation of the skin.